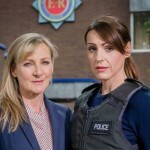 Scott & Bailey returned to the telly last night courtesy of ITV for its 5th series. While it’s been a rather bumpy ride for Detective Constable Rachel Bailey (Suranne Jones) since her beginning days with the Syndicate Nine Major Incident Team, I always found myself pulling for her to catch a break, make even one right decision or skillfully dodge the next bullet from DCI Gill Murray, played brilliantly by Amelia Bullmore. For most of the first four series, however, it never seemed to quite work out for her and always at the expense of whatever relationship she found herself in. What seemed to always suffer the most was the relationship with her BFF police partner, Janet Scott (Lesley Sharp). Rachel’s full-time job is now trying to keep the Syndicate 9 group together while convincing them to put their big kid pants on for their latest case. Unfortunately, the new series is comprised of only three programs but they are as tension filled as you can get as they tackle their darkest and most disturbing case yet trying to catch a murderous mastermind (or masterminds) hiding on the Dark Net who posts video footage of murders for sport. The good thing for long-time Scott & Bailey fans is that amidst all of this, the professional and personal drama between Rachel and Janet that we’re all accustomed to is still there. Even though creator Sally Wainwright has since departed, series 5 is better than the law allows. 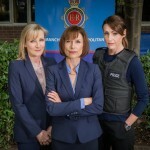 Scott & Bailey continues Wednesday 20th & 27th April at 9pm on ITV. Public television in America soon to follow. SO MUCH LOVE! I can’t wait! I’ve missed both Suranne Jones and Lesley Sharp. I wish I could move to Britain and see all these great shows first hand.